Keep your home safe with this cordless, motion-activated security light. 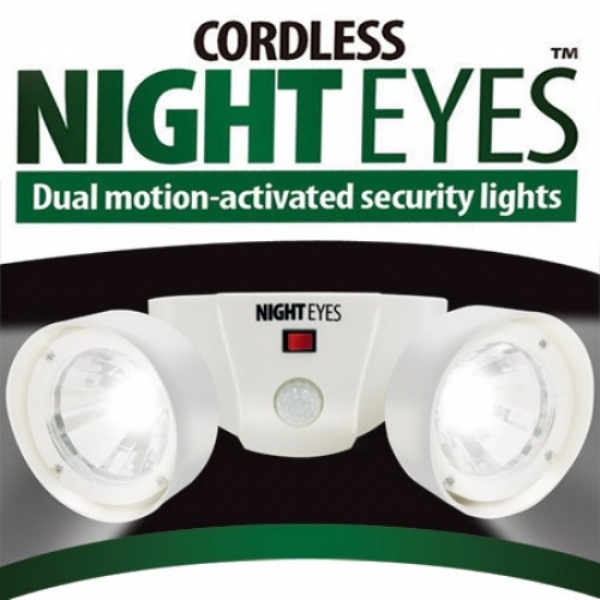 Keep your home and family safer Night Eyes Security Lights as seen on TV the cordless, dual motion-activated security light. Automatically turns ON when motion is detected. Detects motion up to 10&apos; away. Stays on for up to 50 seconds. Lights rotate any direction. Super bright LED bulbs stay bright up to 100,000 hours. Ideal for doorways, paths and yards for safety and security. Weather resistant, designed for outdoor use. Requires 3 AAA batteries (not included). Approx. 6"x 3"x 6"
Warning light for patio deck to intruders. Can set lights on end table, not install on stucco wall. Need larger beam of light for viewing. This night eyes security light is not as bright as I expected it to be, but it serves the purpose for my needs. I placed it in my garage. It is an excellent product. You need three AAA batteries, not provided. The square compartment has to be unscrewed with a Phillips screw driver to insert the batteries, Make sure you line the compartment lid up properly before replacing it, Seal it properly so no rain or other unwanted elements can get in if you are placing it outside. Mine is inside, so it should be fine. On/off switch is manual, and when in the on position, it turns on/off automatically in about nine seconds. I would recommend it as long as you don&apos;t need it to activate more than 10 feet away from where it is installed. It lights up as I drive into my driveway when I get off work in the dark.